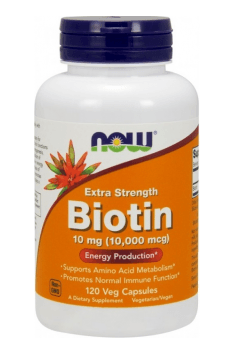 Now Foods Biotin 10mg is a supplement providing as much as 10 000 mcg of biotin in one capsule. Biotin, also called vitamin B7, demonstrates a range of beneficial properties towards the state of skin, hair and nails (hence its yet another name – vitamin H – coming from a German word Haunt – skin). It is also a coenzyme of carboxylases, thanks to which it takes part in many energy transformations in the organism. The main feature of biotin, which is responsible for the majority of its effects, is the presence of sulfur atom in its molecule. Vitamin B7 not only provides it to the organism (endogenous production often turns out to be insufficient because of the plentitude of reactions that sulfur is engaged in), but it also facilitates its transport to cells exhibiting the highest needs for this element. The above mentioned cells are mainly the cells of skin, hair and nails, therefore, they will show the most spectacular effects of supplementation with biotin. The results that may be expected are: improved state of skin nourishment, limiting of its exfoliation, increased thickness of nail plate and its increased mechanical resistance and limiting of unprompted hair splitting. Measurable effects also stem from another incredibly vital function of vitamin B7. It is the coenzyme of carboxylases, the enzymes responsible for transporting carboxyl groups to organic compounds. In this way, it takes part in many metabolic processes in the organism, especially in the reactions, which allow the system to produce energy, i.e. lipid and carbohydrate transformations. Studies show that supplementation with biotin considerably influences balancing sugar level to such an extent that it is recommended as the supplementation in the therapies of diabetes. Biotin also demonstrates a correlation with branched-chain amino acids (BCAA) in the processes providing energy to nervous system cells. In this way, it slows down the time of developing the feeling of fatigue in the organism and increases effort abilities. Biotin deficits may also be visible as pathological behaviors of the nervous system, such as muscle contractions or shaky hands. Vitamin B7 along with vitamin K is also responsible for the synthesis of the so called II coagulation factor, prothrombin. It is a glycoprotein, the main function of which is providing thrombin in the system to the reaction of blood clotting, in which it transforms fibrinogen to fibrin fibers creating the core of the clot. The product by the company Now Foods is characterized by a very high dose of biotin per one capsule, as much as 10 mg, which is 33 times higher than minimal daily needs. However, when we want to achieve visible effects of supplementation with biotin, such large doses will ensure the highest effectiveness. Due to the character of skin tissue transformations, achieving visible results also requires patience. Summing up, NOW Foods Biotin 10mg is an incredibly concentrated supplement providing one of the most important vitamins, i.e. biotin. Its supplementation is recommended not only to directly improve the state of tissue nourishment, but also to ensure the proper functioning of the basic metabolic processes in the organism. Biotin is a compound which is relatively sensitive to environmental factors, such as temperature, light or extreme pH values. Therefore, I recommend storing the supplement in a shaded and cold area (in case of relatively warm flats, I would recommend to store the product in the fridge, for prophylactic purposes). There are practically no studies proving that the excess of biotin may be harmful for the human organism, but the dose provided in one capsule is sufficient to feel the whole effect of supplementation with vitamin B7. Rice Flour, Cellulose (capsule), Silica and Stearic Acid (vegetable source). Triphala is a potent yet gentle three-fruit herbal complex that supports GI (gastrointestinal) tract wellness. The combination of two different forms of vitamin A; the highest bioavailability and assimilability.